The MBT-40 Multi-Body Transformer in dump body configuration. The MBT-40 converts from water truck to dump body in about five minutes. Western Star introduced its XD Offroad line at a media event in South Carolina, debuting the XD-40 and its siblings that will be the first wave of machines targeted at dedicated offroad uses. Built with heavy-duty components, the trucks are intended for extreme service and ease of design for buyers. But the highlight of the line is what the company is calling the MBT-40 – the Multi-Body Transformer. Based on the XD-40, the MBT-40 was created by Western Star, Palfinger and Carco as a truck that can swap out bodies in minutes, allowing it to be used for multiple operations on the jobsite. 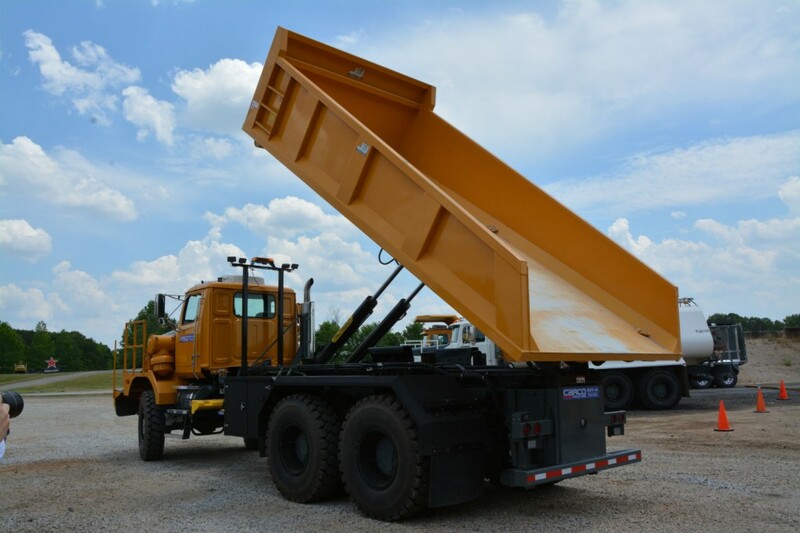 The truck uses a Palfinger G68 hooklift that can grab the truck body and lower it, then roll another body on in its place. Western Star demonstrated the ability by swapping a demonstration truck over from a water truck to a dump body – in about five minutes. A bolt-down fifth-wheel unit can also be placed on the chassis, making it a tractor. A demo unit was shown hauling a 70-ton side-dump trailer across rough and challenging terrain during the media event. Numerous body builders have taken part in the development of the XD-40 chassis and offer bodies ranging from dump to boom lift uses. The trucks are designed for ease of specifying, with a number of packages offered by Western Star dealers. Those packages also mean ease of maintenance and repair, with overnight parts availability. The XD Offroad package is available on the 4900 and 6900 model trucks. Western Star demonstrates the MBT-40 Multi-Body Transformer in water truck configuration. The MBT-40 Multi-Body Transformer with fifth wheel and side dump.